There are spambots roaming the internet that target helpless forms and submit repeatedly to these forms with garbage information. One defense against spambots is to use a CAPTCHA which are randomly generated fuzzy characters. The person completing the form must type in the matching characters to prove that they are human and not a computer. Each time the form is displayed the fuzzy characters are different. 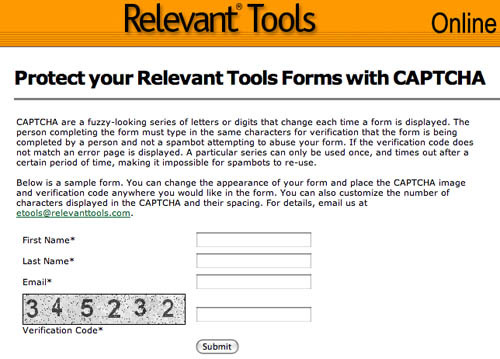 It is easy to setup CAPTCHA with Relevant Tools web forms. 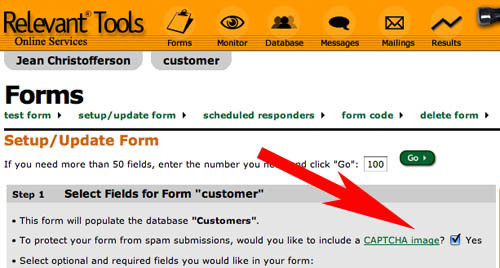 In the forms setup area all you need to do is click the CAPTCHA option and the form code will automatically be generated for your form. By default the CAPTCHA will be placed as the last item in the form just before the submit button. You can move the code to a different location in your form if so desired. Let us know if you need help doing this. Using the default setup will enable you to use CAPTCHA to protect your forms without worrying about any of the technical details. If you need to change how it looks and need help, just let us know.